Sorry to be political for just a minute but I promise this post has a non-bias, positive and productive ending. 2016 was not the best year of my life. For people like me, the world seemed to shift in a frightening direction towards isolation and polarised societies. As an educator, I’ve spent the last 6 months considering what has gone wrong and is it a matter of failing education producing “post-truth” generations who fail to question such things as fake news. This is where a randomised suggestion from TED.com seemed to offer me a gentle, concise, but powerful solution to all my concerns – Listening. I’d summarise 2016 as the year people failed to listen to others. A year where locking out debate and the thoughts of others became legitimised. Even the idea of listening to experts was questioned on both sides of the Atlantic. So I’d like to introduce you to (or remind you of) Julian Treasure. In this talk, Treasure addresses our society’s shift towards too much noise (think social media and the pace of life) and thus loss of skills in and desire to truely listen to people and our surroundings. Here is an edited summary of Julian’s 5 suggested exercises that I believe could transform your classroom, and possibly even improve grades, not to mention, save the world! The Mixer: “listen in the [classroom] to how many channels of sound can I hear? How many individual channels in that mix am I listening to? … put names to those channels such as: pencil; tapping; pouring paint; bunsen burner. Savouring: “This exercise is about enjoying mundane sounds.” Next time you sharpen a pencil, really listen! It’s a great sound. Listening positions: “Remember I gave you those filters? It’s starting to play with them as levers, to get conscious about them and to move to different places.” This is where you focus on one of the environment’s sounds and consciously enhance it’s volume in your mind by focusing on it intently. I can see these skills apply to nay specialist area such a students using RASA to challenge each other on science analysis. Savouring as a dramatisation exercise, and Silence in ALL tasks – I already use it at the beginning of Design thinking tasks. Teachers need to plan consciously for their use of listening and discuss / teach these skills specifically to improve levels of thinking and empathy practiced by their students. 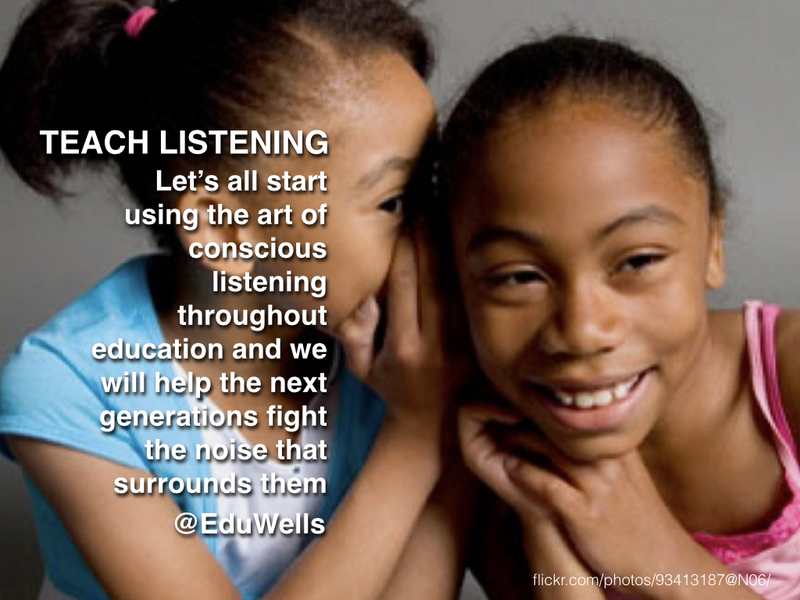 Let’s all start using the art of conscious listening throughout education and we help the next generations fight the noise that surrounds them and avoid another 2016. The U.K. voted to ask foreigners to “leave” only to find out the next day they’d voted for the U.K. to “leave” Europe. “What is the EU” = most popular Google search on that day. The U.S. voted to “drain the swamp” only to find that the “swamp” of bureaucrats and lobbyists were simply no longer needed because the the people who funded the lobbying were to be the new government cabinet. Nobody listened to anyone who didn’t already agree with them entirely.